Southeast Church Supply features�24 hour secure online ordering ! We utilize the latest technology to make sure your credit card information is secure and your shopping experience is safe and easy.�If you require assistance, please call Toll Free�800-942-7327 M-F 9am to 5pm CST (-6GMT).�or email�us.�Located�on the Bay of the Holy Spirit, in Fairhope,�Alabama.�Distribution points located across the country. Churchproducts.com specializes in�high-quality clergy goods, church furniture, and furnishings, liturgical supplies, church metalware, communion ware, church candles, vestments and other church goods.�Family owned, Southeast Church Supply / Churchproducts.com�has been�in operation since 1979 (on the web since 1998)�and trusted by over 10,000 churches! In�addition to�the church furniture and church furnishings on�our web site, we have thousands of additional products for your church. See some of our catalogs here or call us with your requirements. We got our start in 1979, selling religious candles to the Catholic, Episcopal & Lutheran churches of Georgia, from our Atlanta warehouse. As we grew, our church customers�asked for different products, so we added church furniture,�furnishings, church metalware, steeples, church baptistries, liturgical furnishings and more! In 1998, we established the web site churchproducts.com, however sales still came primarily from our local customers. As the internet grew, we saw sales coming from areas that once would have been nearly impossible. Churches in New York, California, Texas, Florida and all areas in between began ordering their church supplies from our online store. We began to�see orders from foreign countries: Canada, Mexico, Australia, Ireland, Great Britain, Italy, Austria, Switzterland,�the Bahamas, etc. We truly became an international church supply store. While we do maintain a warehouse for some items, for cost efficiencies, most of our church supplies ship directly from the many fine�factories we represent. So even though you�are ordering from a company in Alabama, your order might ship to you from New York, Chicago, Texas, Atlanta or any of hundreds of other locations. We've been in business since 1979. Quite simply, you don't stay in business for 35 years unless you are doing something right. Our reputation for quality products and exceptional service. Don't just take our word for it, read what our customers say here. Product knowledge. With our years of experience, we know the products we sell and can advise you of the pros & cons as well as assist you in selecting the right item for your church. We don't just sell you a product, we try to provide you the right fit. We even downsell if we think it best for the customer. You won't find many business books suggesting you downsell a customer, but if we feel you can be better served by a lower priced item, that's what we'll suggest. We consider ourselves your partner in ministry and part of that partnership is trying to make sure your church's money is wisely spent. Test us out-give us a call to discuss your needs! We specialize in the furniture and furnishings that are used in the church sanctuary. 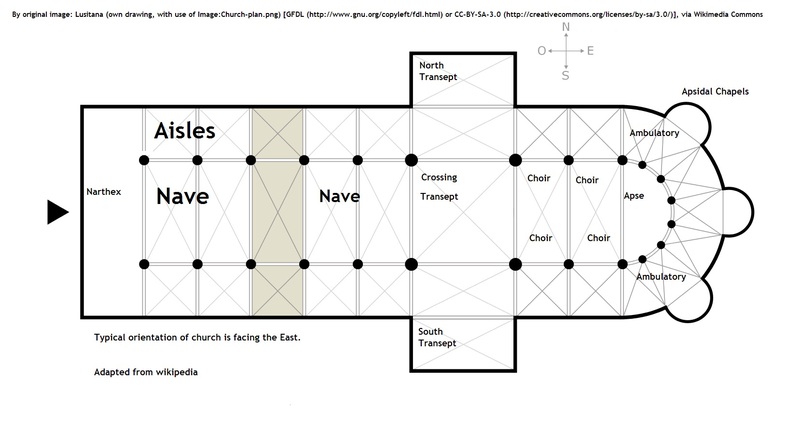 Here's a diagram showing the layout of a traditional church sanctuary along with the proper names for each. We carry furnishings used in every part of the church! Narthex- The entry of the church and is usually seperated from the sanctuary by a permanent wall. Register stands, benches, chairs, usher's tables, signage, etc. Nave- The area where the congregation sits. Transept-The horizontal arm of the cross. Seperates the Nave from the Choir. Side altars may be located in the North or South Transept. Crossing-The main altar will usually be located in the Crossing. Apse-The half-circle area between the choir and the ambulatory. It represents the end of the main building or Chancel and may or may not contain an altar. Prior to Vatican II, the priest faced the altar, which would be located in the apse. Following Vatican II, the altar was brough out to the crossing, so the priest now faced the people. The apse is where you would normally seat members of the clergy. Ambulatory- The walkway area behind the apse which would be used to access the absidal chapels or in some churches the vestry or sacristy. What's the difference between a basilica, a church and a cathedral? 1) Major Basilica-A Major Basilica has received this designation via Papal authority. It confers the status of a large or important church with special ceremonial rights. Basilicas are typically pilgrimage churches.�There are 4 Major Basilica's, all located in Rome. St. John Lateran, St. Peter's (The Vatican), St. Paul Outside the Wall and St. Mary Major. 2) Cathedral- The Cathedral rank means this is the home church of the Bishop of the diocese. 3) Minor Basilica - A Minor Basilica has received this designation via Papal authority. It confers the status of a large or important church with special ceremonial rights. Basilicas are typically pilgrimage churches. Minor Basilicas may be located throughout the world. 4) Parish Church - The typical diocesan church without any special priviledges or charters.